This is how we all felt on Tuesday! It was pouring on Tuesday morning, but I never let the rain keep us from our dog walks. Around 7 am, we headed out for a mile walk. The good thing about rainy days is that the dogs aren’t as hyper. They love to nap and lay around, which helps me get things done. Lately, I’ve been trying this new thing (a thing most normal people do.) I tend to snack a lot instead of having meals. I snack on healthy things, but I never feel full. I’ll usually have a power bar with coffee, yogurt later in the morning, a handful of carrots with hummus around noon, a protein shake later afternoon, and then a giant salad at night with some kind of protein. For some reason, that pattern leaves me searching for snacks at night. The whole grazing thing has me grazing too much. I decided to give myself an eating schedule. Instead of the random snacking throughout the day, I’ve been having actual meals three times a day with no snacks in between. I’ve been doing this for a week now and it’s made a big difference. I never find myself wandering in the kitchen at night looking for something to eat. I’ve been drinking more water, tea, and feeling more intuitive with my cravings. I eat at 10 am, 2 pm, and 6 pm. Anytime after 6 pm or before 10 am, I make sure to drink a lot of water or decaf herbal tea. 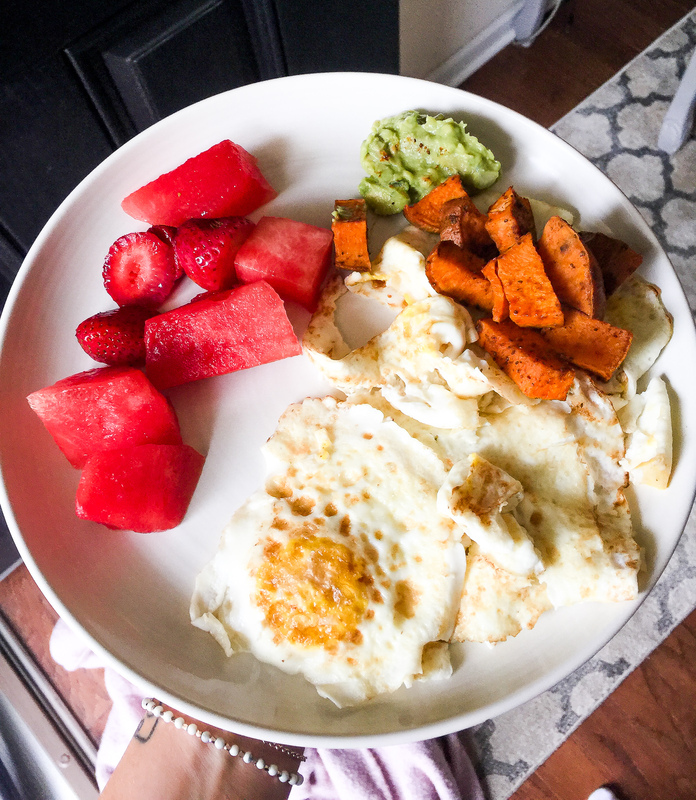 For my Tuesday breakfast, I had 1 egg yolk with 4 egg whites, fresh fruit, sweet potatoes, guacamole, and a scoop of protein powder with cashew milk. I had soup for lunch and soup for dinner on Tuesday night. 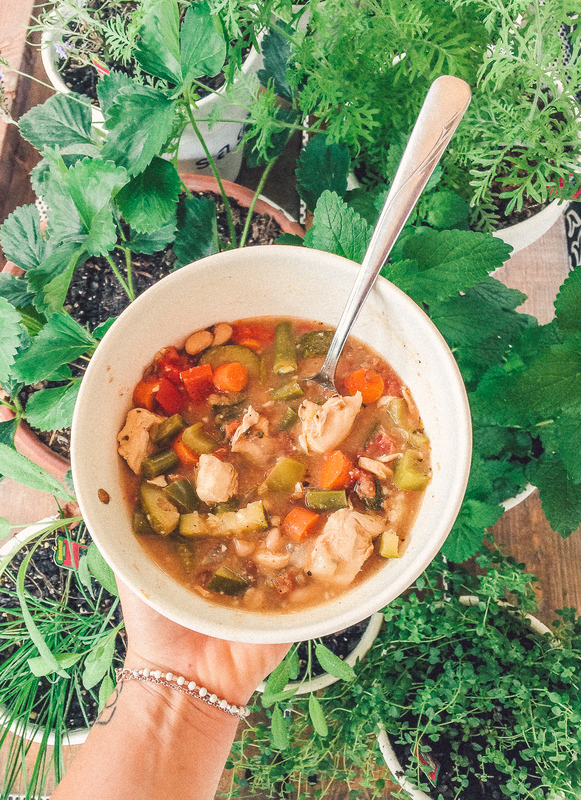 It’s a spicy chicken and vegetable soup that I’ve been eating on repeat. You can find the recipe here. I spent most of the day on Wednesday blogging some posts that’ll be out soon, creating my summer schedule, and running errands. I had a protein shake with oatmeal for breakfast on the go because I was running a bit late for an appointment. I had a delicious lunch at 2 pm. 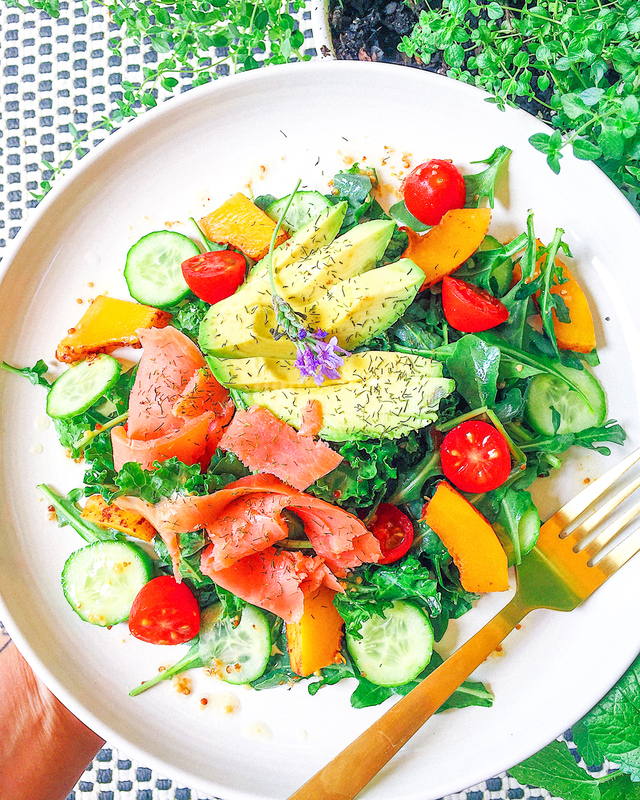 I tossed arugula with Primal Kitchen honey mustard vinaigrette and topped it with baby cucumber slices, cinnamon-honey roasted butternut squash, tomatoes, avocado, smoked salmon, and a sprinkle of dill. 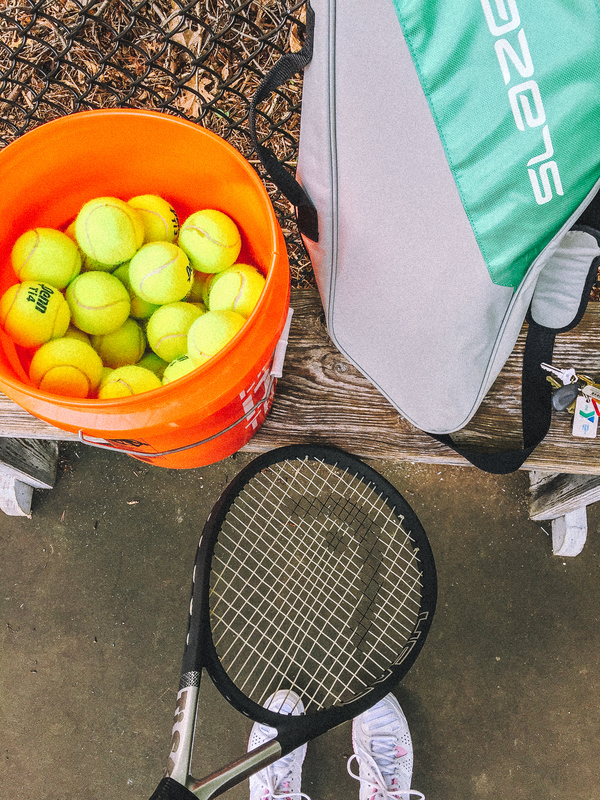 After having a bowl of chicken and vegetable soup for dinner, I headed to the tennis courts with my bucket of balls to workout and practice my serves. My tennis workout is on the Simply Taralynn Fitness Challenge Instagram page under the “fitness” highlights. I decided to do yoga early Thursday morning after my dog walk. I did the morning yoga video out on my back porch because it was so nice out. 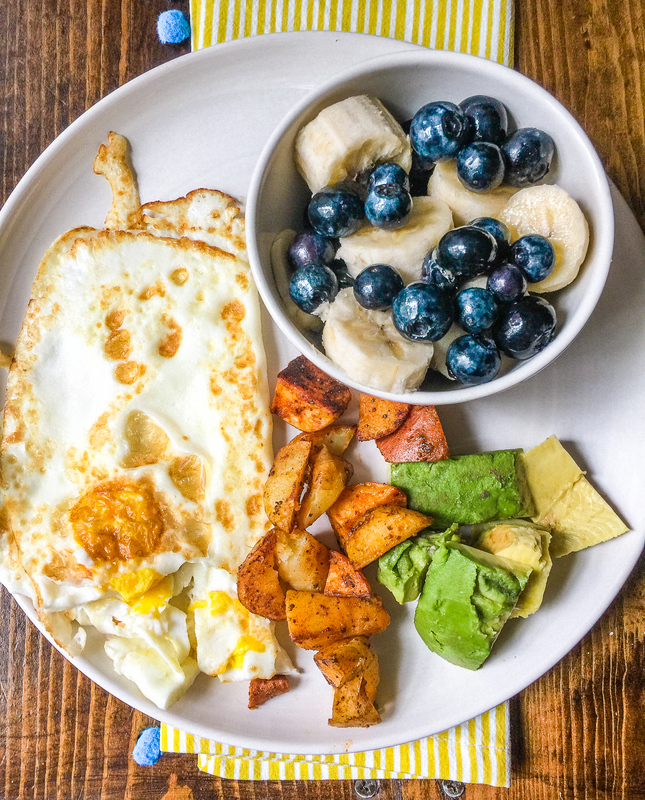 A little later in the morning I had seasoned potatoes, avocado slices, blueberries, banana, and 1 egg yolk + four egg whites for breakfast. I had my soup for lunch (can’t imagine taking photos of the same soup every day) and spaghetti squash with ground turkey and pasta sauce for dinner. I love making this for a quick dinner option. I roast the squash in the oven for 45 minutes at 400 degrees, scoop out the squash into a bowl, and mix it with a no added sugar pasta sauce, and cooked ground turkey. Three ingredients and it tastes amazing! Sometimes I’ll make a Caesar salad for a side. I headed to Target on Thursday evening because I broke my sunglasses and needed to get a pair before my morning dog walk. It gets super sunny in my neighborhood and there is nothing worse than squinting for several miles. 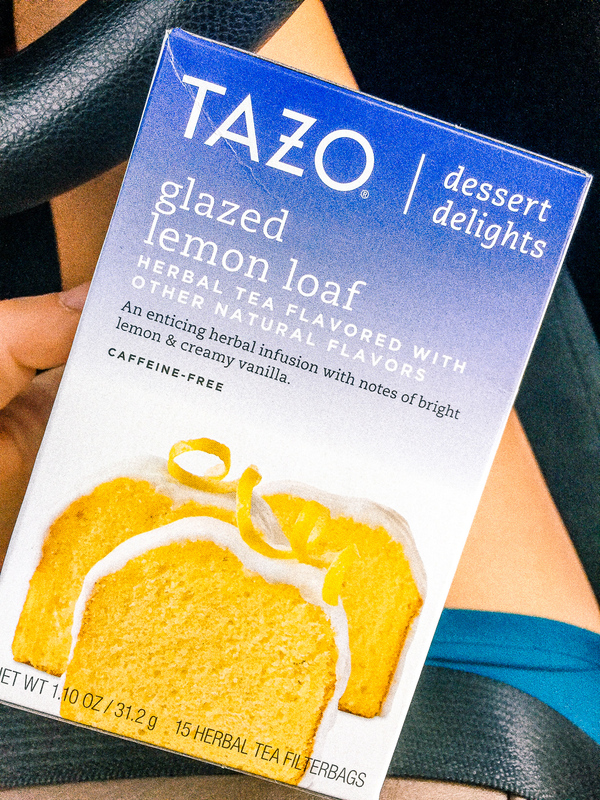 While I was there, I picked up some Tazo dessert tea. The glazed lemon loaf is AMAZING!!!! It really does taste like lemon cake 🙂 The other two flavors didn’t taste like macaroons or bourbon blondies, but they didn’t taste bad either. If you see these at the store, definitely go for the lemon cake. I hope they come out with a key lime pie flavor. I’ve been looking forward to having a cup of this tea every night as my treat. It totally takes away the sweet cravings. 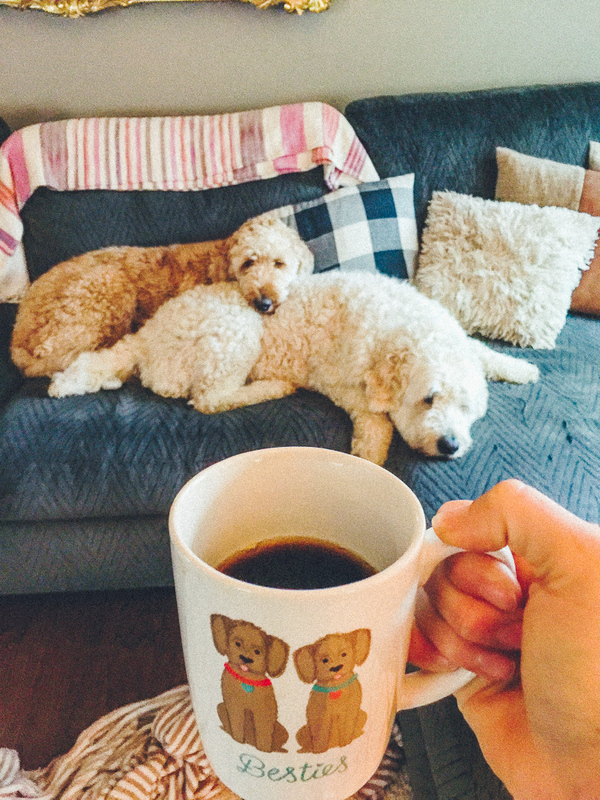 After our long dog walks on Friday morning, we relaxed while I worked on the blog. Leo is so cute when he cuddles up to his brother. I know I’m a crazy dog mom, but I can’t help it! It was gorgeous out, so I decided to go for a four-mile walk. I love my dogs, but sometimes I like to do a speedwalk without having to stop to sniff. I caught up on the Off The Vine podcast and time flew by quickly. When I got back, I made a delicious breakfast. I’ve been eating these pancakes on repeat and I can’t get enough. I have the blog ready to go, so look out for the recipe coming soon! I had my protein pancakes with 1 egg yolk + 4 egg whites, banana, and blueberries. I decided to have a protein shake for my lunch. I wanted to save room for poke night. My mini protein shake had 1 scoop of chocolate Orgain plant protein, 1 cup fresh cherries, ice, unsweetened cashew milk, and topped with coconut chips (so damn good) and candied pecans. 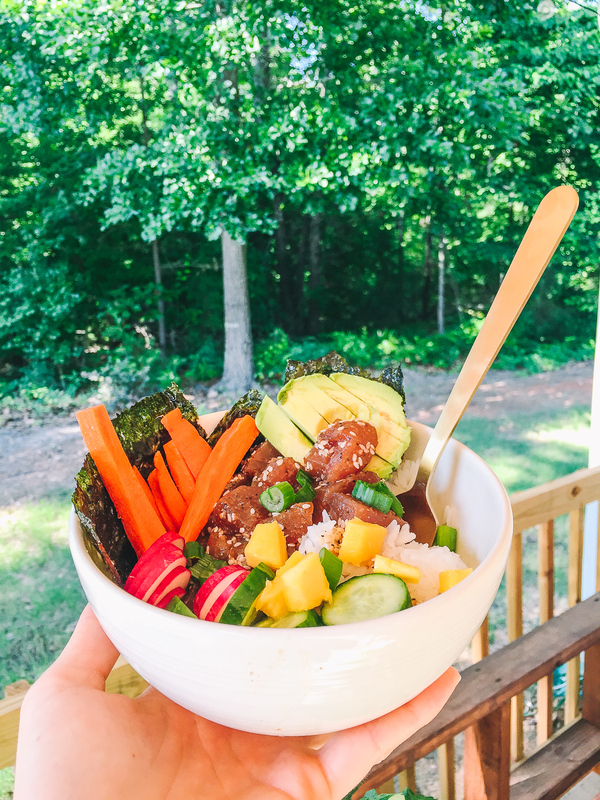 I made poke bowls for dinner on Friday night! They were delicious and I can’t wait to post the tutorial 🙂 I had a lot of people asking where I found Grade 1 tuna for the bowls. I asked the seafood counter at Whole Foods, and they had me go to the sushi counter where they sold the highest quality tuna. They had it available. On Friday night, Kyle and I watch the latest episode of Handmaids Tale and finished Safe on Netflix. We were both tired and just wanted to lay around watching movies instead of our original plans of playing tennis. I was so glad we rested on Friday night because we were super recharged on Saturday. After the morning dog walks, we headed to the gym together. 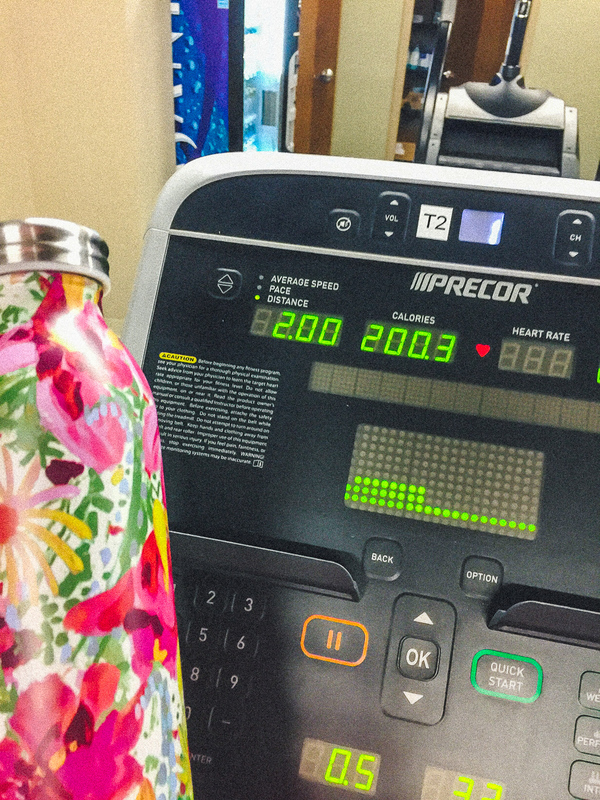 I did a little lifting (for like ten minutes) and then did intervals on the treadmill for two miles. I usually sprint uphill 1 minutes, jog flat for two minutes, walk uphill for three minutes, and repeat until I hit two miles. Kyle and I had protein pancakes and eggs for breakfast. These pancakes are so good, I’m going to have them again for breakfast today and probably tomorrow. We met up with my parents at noon to play tennis. This is one our favorite things to do on Saturdays! We have defeated my parents five times in a row now, so they are trying their hardest to grab the title back. It’s funny because Kyle and I used to get creamed by my parents and all of our practice has paid off. My parents are pretty good at tennis so we feel pretty good about our wins! My parents invited us over to grill again, and we didn’t have anything going on, so we thought it would be nice to swim a bit and let the dogs run around the backyard. 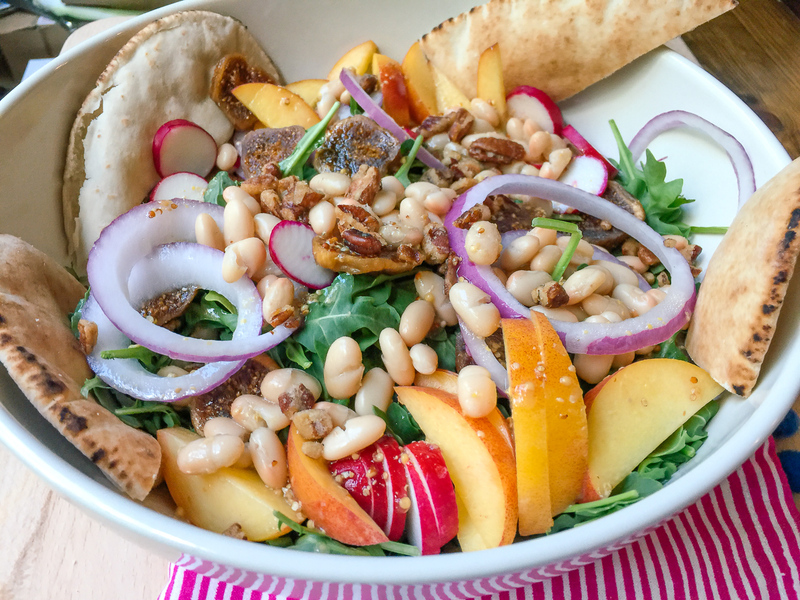 We picked up some burgers, I made a delicious white bean and peach arugula salad (recipe coming soon) and we headed out to their house with the dogs around three. I bet my dad is in the backyard right now as I’m writing this practicing his throws. The pool felt so good after being out in the sun all day. We had dinner around 5:30, and I was so hungry! 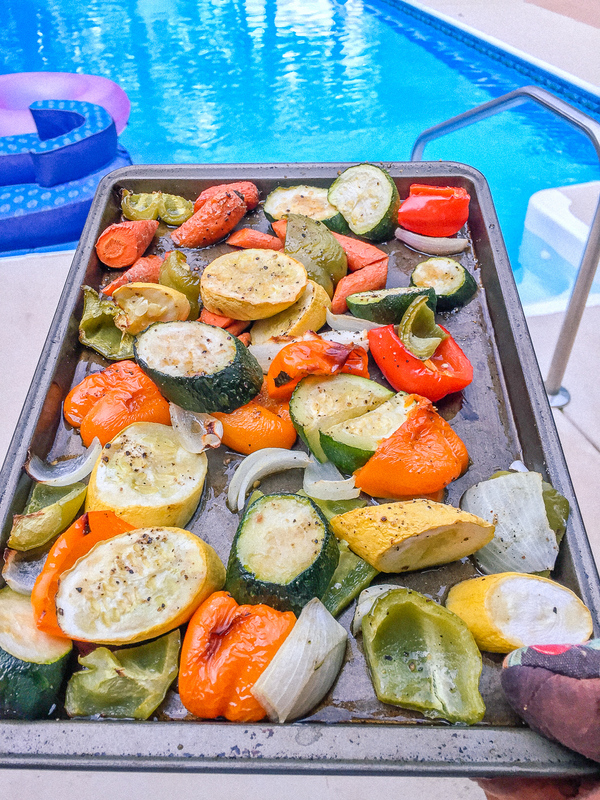 My mom made delicious roasted vegetables, my favorite! It started to storm as soon as we finished making dinner, so we decided to eat inside. 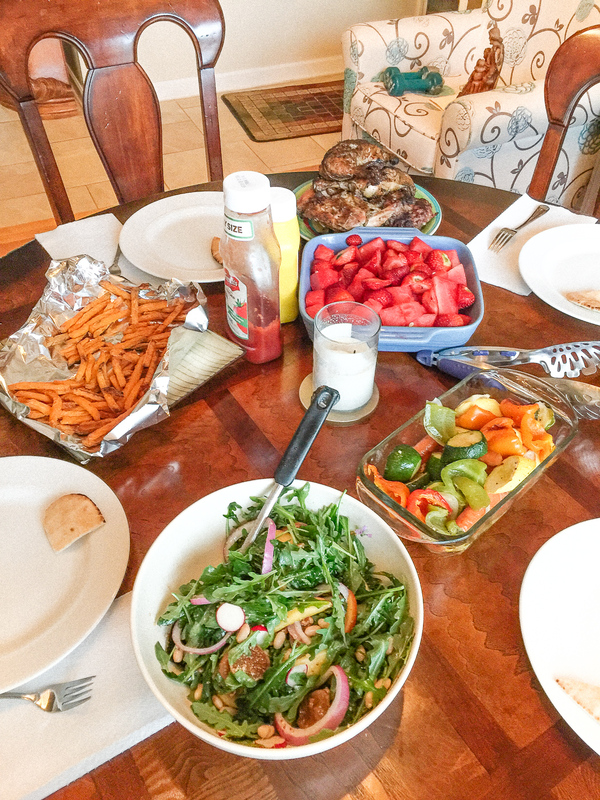 My dad grilled chicken, jalapeno burgers, and we had all kinds of delicious sides. I’d be OK making this a Saturday tradition because it was all delicious. 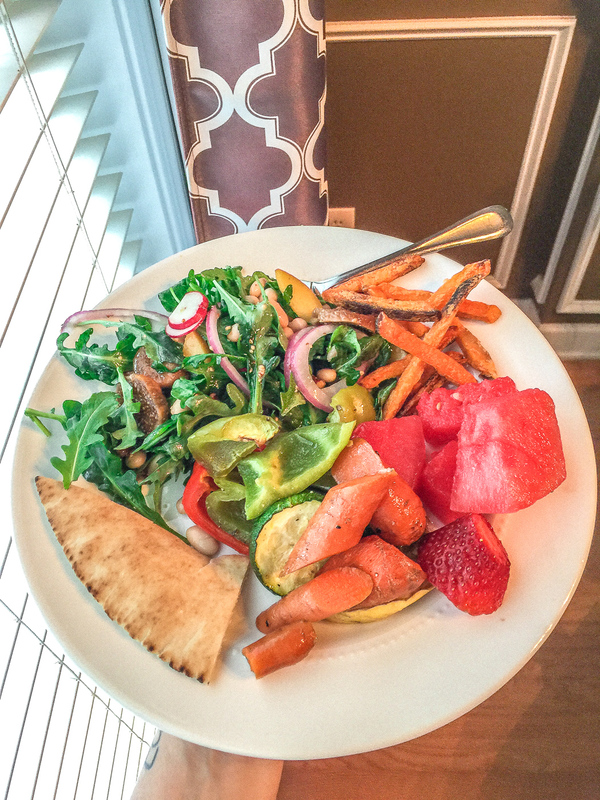 I had my arugula salad (holy moly so goooooood), fresh fruit, sweet potato fries, and roasted vegetables! Kyle and I headed back to my house later in the evening. We took the boys for a dog walk, and then I showered off and got ready to just relax for the rest of the evening. Kyle and I decided to watch Unsane and it was really really good! 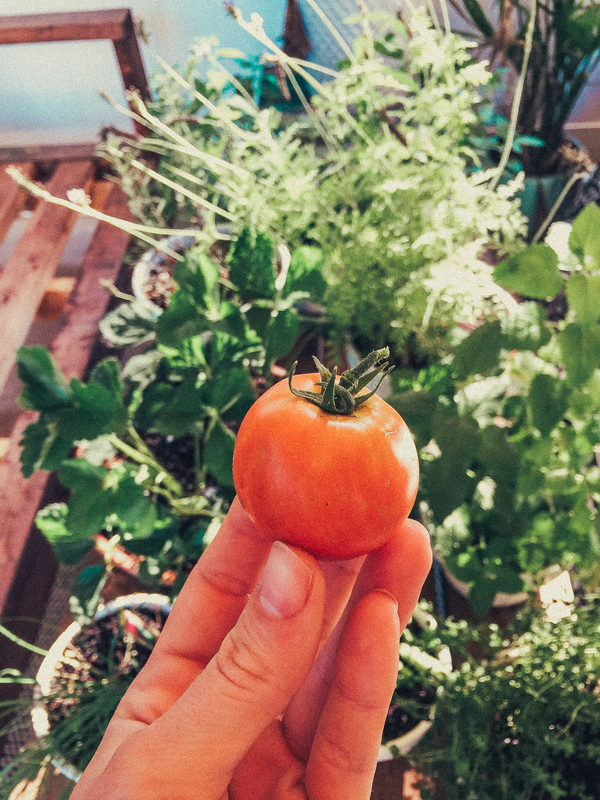 I picked my first tomato in my backyard garden on Sunday morning! It was so cute and perfect 🙂 I was pretty proud of myself. After heading to Home Depot to pick up some garage shelves, I had my breakfast! 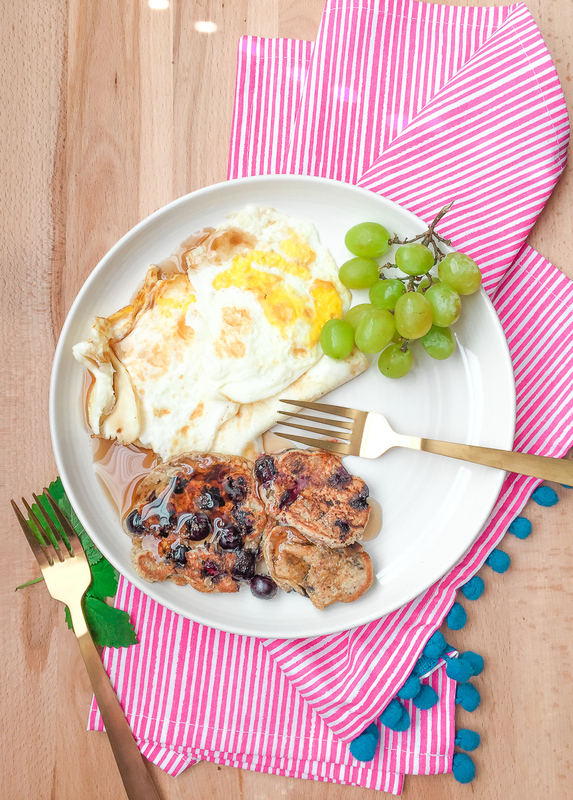 Pancakes on repeat, cotton candy grapes, and eggs. If you’re wondering, YES, cotton candy grapes really do taste like cotton candy. I spent about three hours cleaning out my garage, breaking down boxes, and organizing everything on the new shelves. 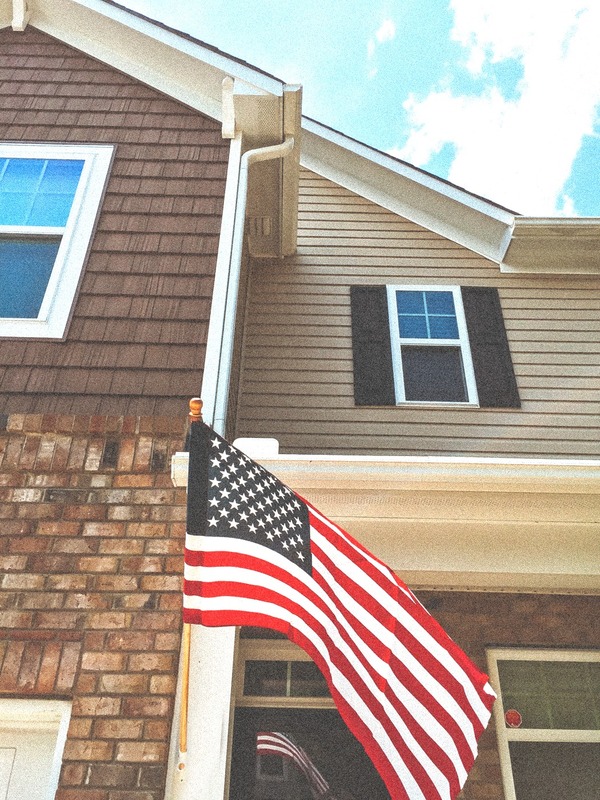 My dad stopped by to help me put up my new flag on my house. I was so excited to get a flag up. Now, I need to find a light to shine on it at night. 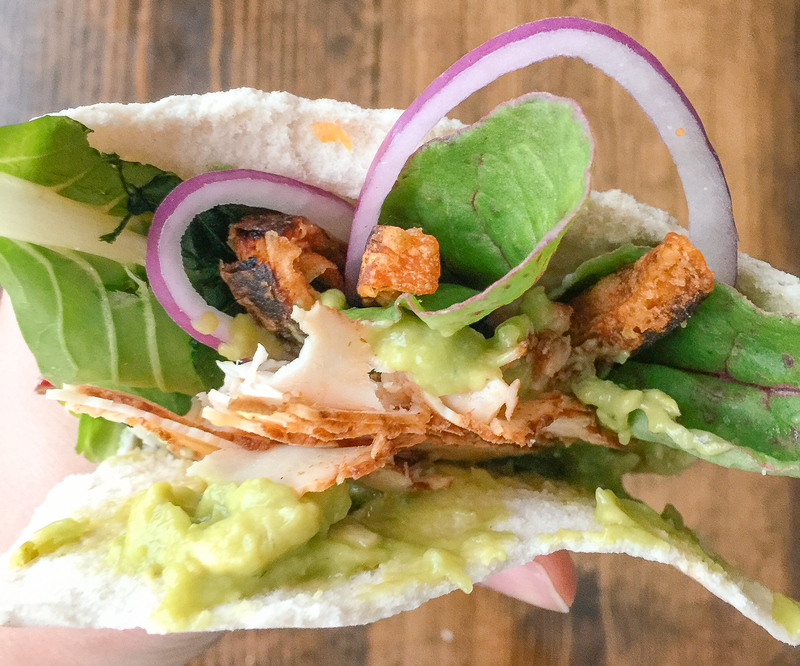 For dinner, I had a B Free gluten free/dairy free/vegan pita stuffed with guacamole, chicken, sweet potatoes, mixed greens, onion, and mustard. Yum! After dinner, I made a little bowl of popcorn and Kyle and I watched Game Night. That movie is so funny! I definitely recommend it. After the movie, we went on our final dog walk and came in to watch the NBA Finals. Of course, I fell asleep during the second quarter. Today is day 26 of the 40 Day Challenge, and I’m feeling so great! I can definitely feel and see a difference, and can’t wait to continue this journey with everyone participating! My progress is slow, but that’s how it’s supposed to be. 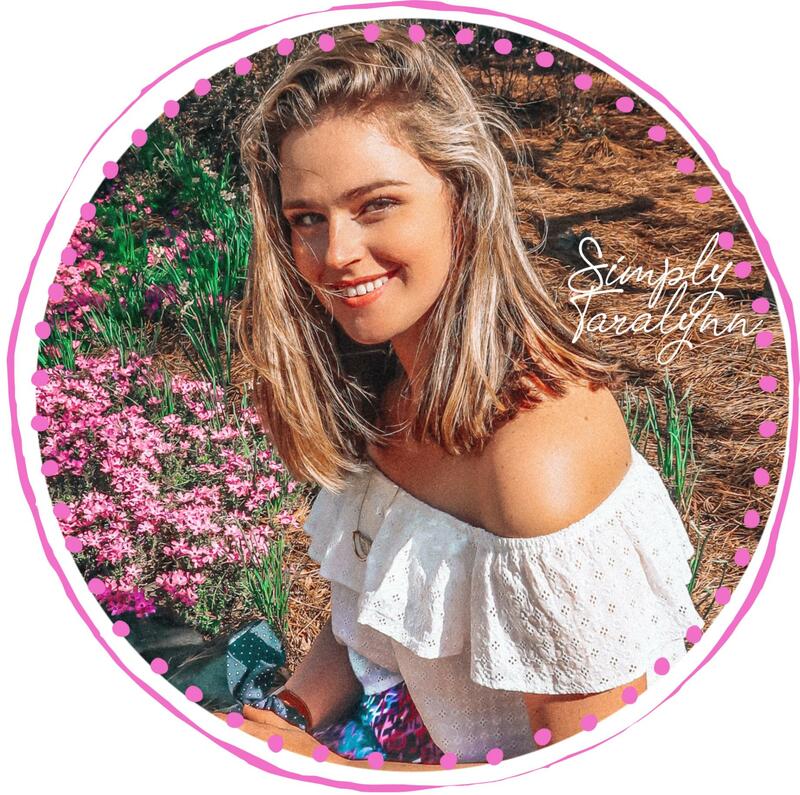 If you need some inspiration, check out the posts here! 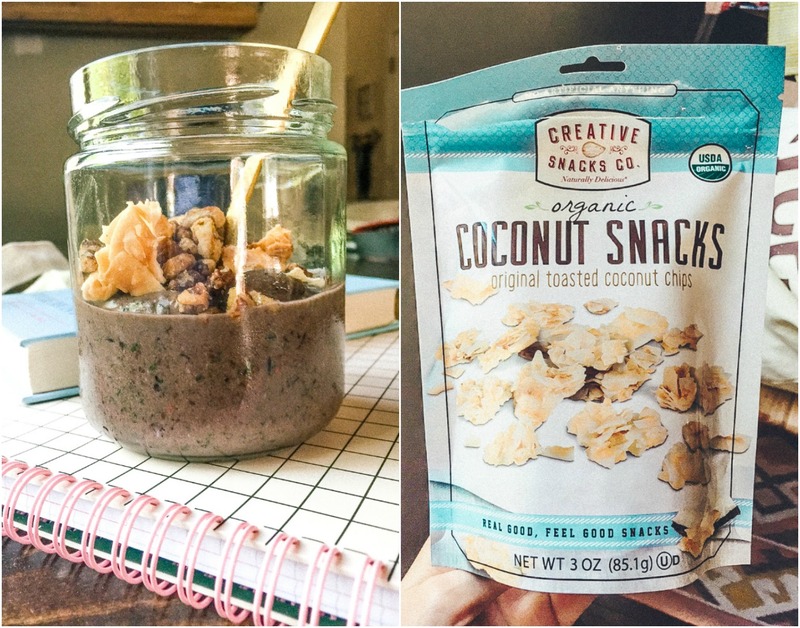 Are you a snack all day person, or a three meals a day person? Have you grown any produce this year? I used to take lessons from your brother at the country club when I was ten! That is so cool! He’s a good player! I love the idea of eating meals instead of snacks. That is my problem too! It always helps to stick to meals! 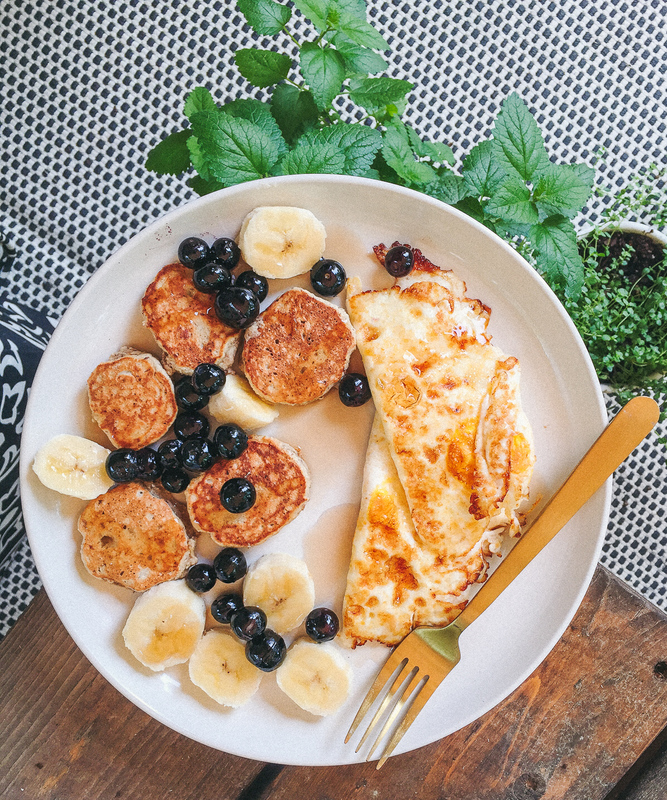 If I start the day out right, then I tend to eat three meals a day and have an afternoon snack (usually fruit or a clif bar) because I chase kiddos all day and need that extra energy! We just planted zucchini and kale again this year, and picked our first strawberries of the season last week! I also start four lemon trees from seeds! I cannot wait to watch them grow! Unfortunately, they don’t produce fruit for at least four years.. I love hiking and going out to do relaxing stuff! If it’s been a particularly long week, I like to do stuff at home. But, if I sit on the couch all day I feel like I wasted so much time, so I try to always be doing something! Sounds like a great schedule you’re on! I bet chasing the kiddos certainly calls for more energy! Wow! You’re a growing machine! I love the produce you chose:) My favorites. Relaxing is great, even if you get nothing accomplished 🙂 Good to rest. Do you have a tennis court in your neighborhood or a pool? 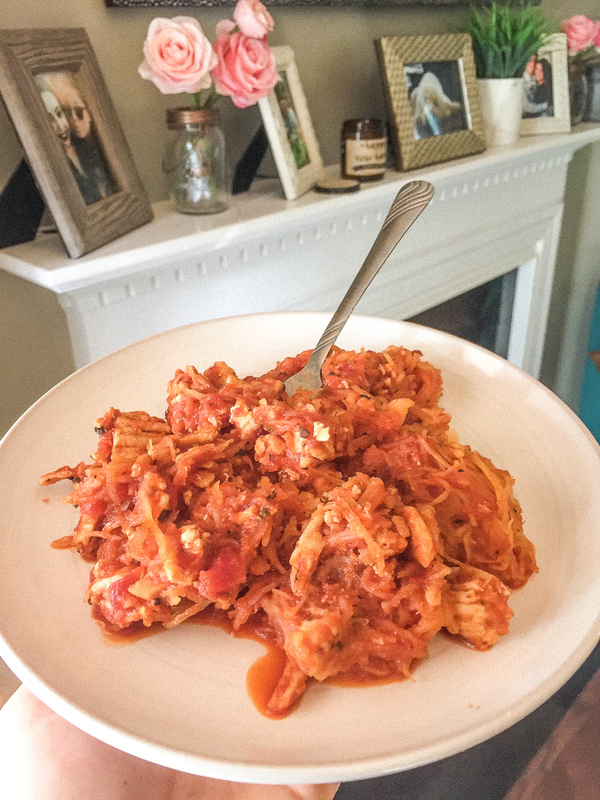 Spaghetti squash, sauce and turkey is my fave. I shred the squash into a colander and put a heavy glass bowl on top of it while I mix up the meat and sauce, to press all the extra liquid out! I see abs! Way to go girl! 😀 And poke bowl fridays are my thing. They are SO versatile and I love that i found a great place to get grade 1 salmon (my fave). I want to try a good poke place around Charlotte! I love poke for sure! Can you make a post on cooking your own meals and kicking off processed/fast food. I find myself eating out so much and I was wondering if you had tips to kick this. 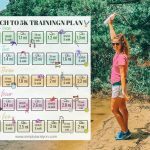 I went for two months watching what I eat, working out, and then I fell off the wagon…. I can’t seem to get back on track no matter how hard I try. I can definitely add this to my list. I think it would be a great post. I graze all day, it’s a problem. Not produce (although I really wanted to) but we do have raspberry plants that were trying to revive. We focused this year on planting lilac bushes and maple trees. Honestly, now that we actually own our home I love being home, relaxing on the patio, playing with the dog & cats and tackling stuff around the house. If we decide to break the mold and do something different, I really like going for car rides north and hiking/paddleboarding on the lake. A huge change from my “party all day every weekend” lifestyle I had in college! I was doing that instead of having meals, so setting the meals has helped SO MUCH! mmmm raspberries are the best! 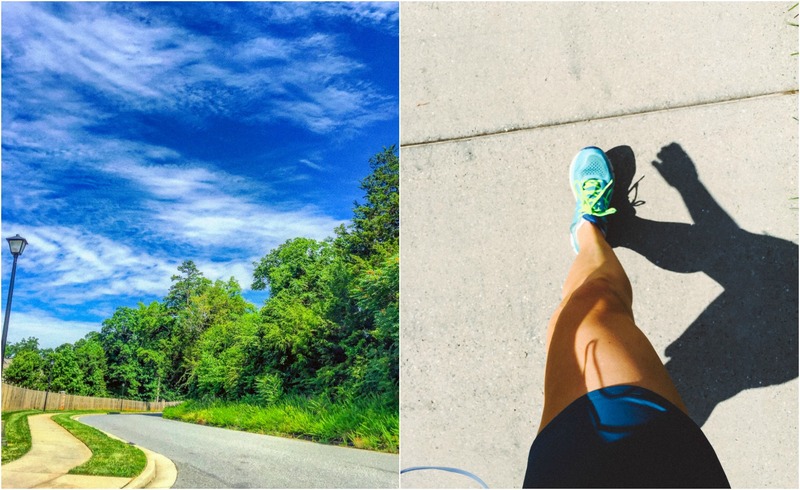 Do you think you’ll do another half marathon? I don’t think so! My body isn’t built for it and the injuries aren’t worth it to me. I do like to run casually though! I can’t wait to read your poke recipe! These bowls are one of my favorite things to eat but I never tried to make them myself! I eat two/three meals a day (sometimes I’m not hungry when I wake up so I listen to myself and skip breakfast), and I usually snack in the afternoon. Clearly, picnic or barbecue with my friends (my salmon terrine is a must!). We live by the beach but I try to be more responsible with sun exposure, so beach days are great, but not every weekend. Yeah, the night snacking used to get me, but afternoon snacking if I have a morning workout for sure! Mint leaves are so great to grow and hard to find at the grocery store! Smart thinking! I love the beach too, but I have to keep busy because I get too bored laying out! lol And it’s always too bright to read on a beach. 1.Are you a snack all day person, or a three meals a day person? Honestly a little of both. I meal prep on Sundays for 3 meals/day with 1-2 snacks either with a meal or between, depending on how I’m feeling. My snacks are usually a piece of fruit or carrots and hummus so generally really small. 2.Have you grown any produce this year? Not yet! I usually have a garden by this time, but this year has been busy for me. I’m starting my herb garden now so we’ll see how it goes! 3.What is your favorite thing to do on the weekend? Ahh herb gardens are the best! 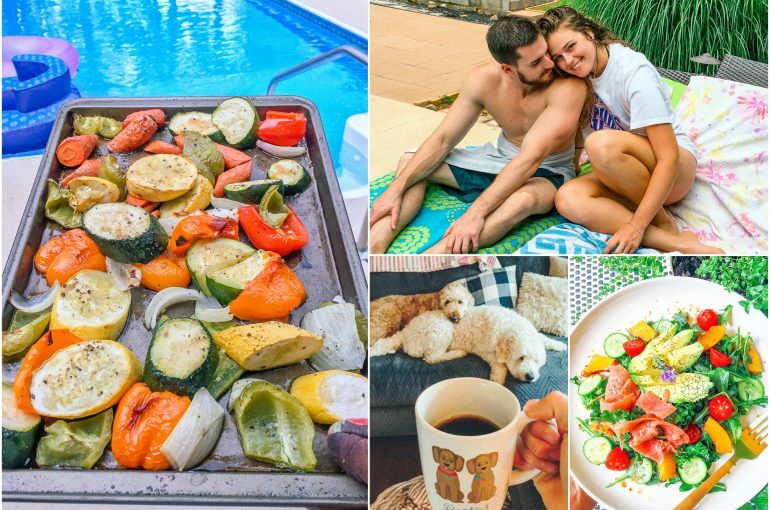 That salad looks amazing, but that pool looks even more amazing! I’m so jealous!!! Do you have a post anywhere about travel snacks/tips? I have only ever done direct flights, and 99% of them have been very early or very late so I just sleep through, but in a few weeks I have a travel day consisting of a 1 hr flight, a 2 hr layover, a 1.5 hr flight, a 2 hr break, and then a 4 hour bus ride! I want to be prepared but I have no clue what to plan for! I’m lucky that parents have a pool. My neighborhood has a nice one, but it’s ALWAYS filled with kids. It’s not as relaxing. Will you do another challenge? I missed the last one! Where are your plates from? The white ones? They are from Pottery Barn! I definitely need three meals a day – I love eating warm food and more elaborate dishes. Also I am on the go a lot, so not having to snack every other hour is much more convenient. My parents have a large garden full of fruit and veggies. Currently its strawberry season – I am in heaven! I totally understand that for sure! :) I just found myself hungry because I wasn’t eating ACTUAL breakfasts foods. I was just snacking. Now that I’m taking the time to eat meals, snacks aren’t always screaming for me. Best way to spend a weekend for sure! Oh. My. Goodness. SO many of the food combos you have been posting make me go, “Oh my gosh! I just made something similar the other day and can CONFIRM the deliciousness. 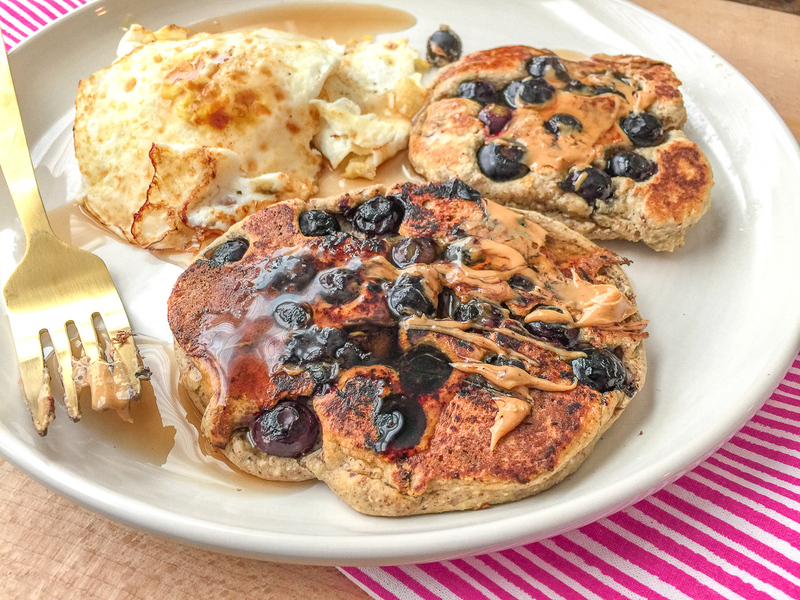 Like, for instance, banana egg pancakes (and waffles… which mixes it up and is still just as delicious) with PB, topped with blueberries and bananas! Y.U.M. And I have discovered a love for arugula recently that I didn’t know I would have ever developed. It’s like, SPICY! It reminds me of Nasturtiums (flowers) that you can literally just eat the whole flower. They have an almost sweet, earthy spice to them. Amazing. ANYWAY! 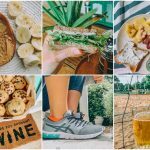 This post was so inspiring for me, it definitely re-invigorated my desire for healthy eating! Recently, all the carbs have been calling my name, and it’s so hard to get out of their grasp once I give in! I am definitely a 5 meal a day person. Being hypoglycemic, I have to watch that my blood sugar doesn’t get the change to drop drastically, or it can have some really unpleasant effects – my mood plummets, my body gets insanely weak, my hands totally unsteady, and in the worst cases, it can make me faint. No good! So, by eating 5 balanced meals in a day, I keep my blood sugars regulated and my body and emotions in check! I literally JUST ate a salad comprised of the lettuce and spinach I harvested from my container garden this morning, and I’m pretty sure it was the most delicious thing ever. That could have been in my head, but I doubt it 😉 Topped with some homemade turkey burgers and homemade honey mustard dressing, it was seriously savory. Matt and I also LOVE to play tennis. We are super spoiled with the courts being only a half a mile from our house, so we just ride our bikes there! We also love to ride the bike trail or just go for long walks around town for exercise together. Board game/card game nights are also definitely a highlight of our weekends! Lol A couple years ago I didn’t care for arugula, and now that’s all I want to eat!!!!!! They are really good with a vinaigrette. Kyle is the same way as you. He schedules his meals/shakes for his levels as well! That’s why we all have to do what’s best for our bodies! Ohhhh homemade turkey burgers are the best!! OMG wish you lived closer! 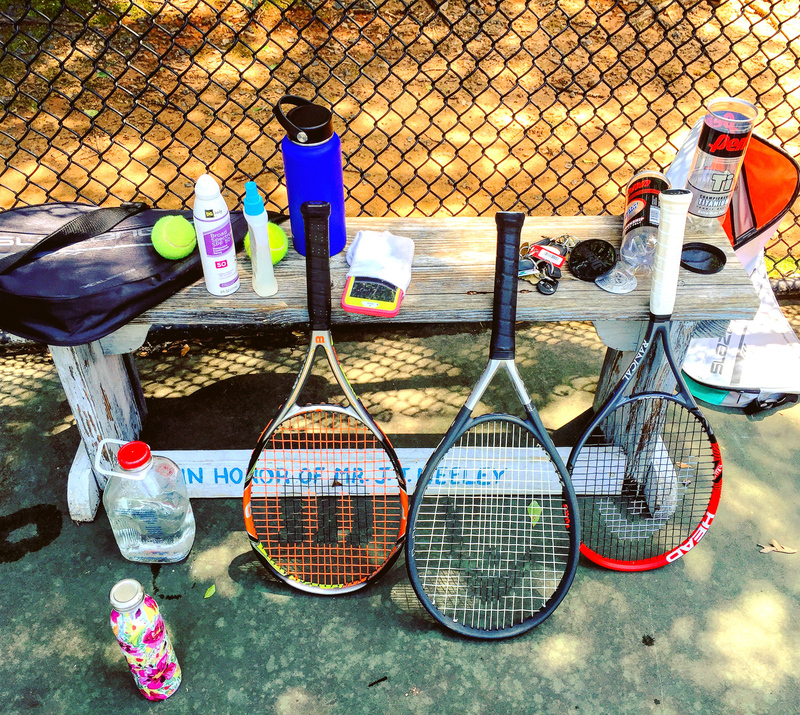 We’d play tennis all the time:) It’s the best way to workout in a fun way! I love the meal idea. I tend to snack a lot! Oof, I’ve caught myself snacking more and more out of boredom lately – I’m going to try out that lemon cake tea because I think that will be “fun” enough to keep me from snacking! It’s the worst habit! I have found myself snacking a lot as well! The meal rule has helped a lot! But that lemon tea is so amazing!! I definitely snack all day in between 3 meals, so a little of both! I have a desk job, so it’s really hard to avoid mindlessly snacking while working…I need to kick that bad habit! I haven’t grown anything…yet!! We just bought our first house and are waiting to get moved in (mid June) to start one. It will be a late garden, which I’ve never done before. So we will see how it does! 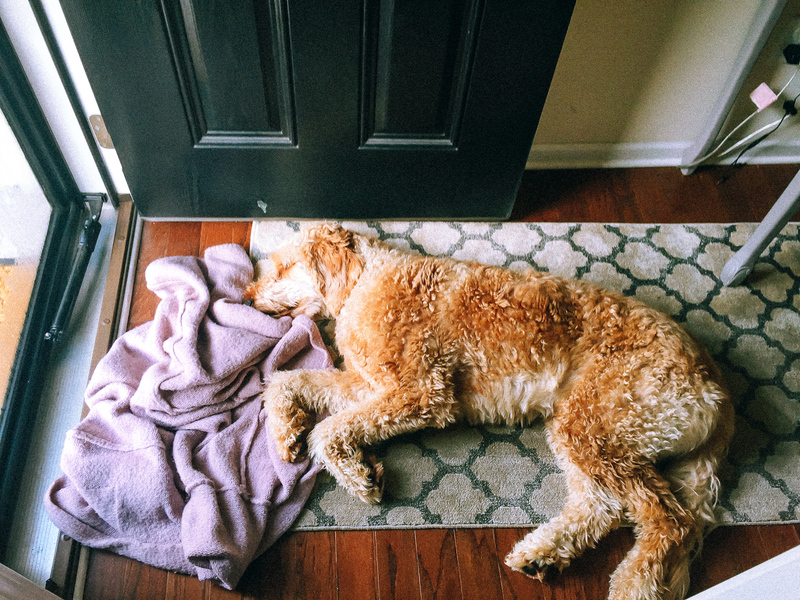 My favorite thing to do on the weekend is R&R! I do a whole LOT of nothing, lol! But, it’s also my time to get caught up on cleaning and laundry, so I find myself staying busy with that mostly. If I’m constantly running around, Monday morning I feel like I didn’t have a weekend at all. So I definitely enjoy some rest time! Your spaghetti squash looks SO good! I’ve never had it before and have been wanting to try! Working from home is AWFUL for mindless snacking as well and that’s kind of why I set my meal rule. It’s really cute my snacking and sitting down to have a meal with no technology is great. I feel ya, girl! You deserve that R & R! OMG, it’s such a game changer! I think you’d love it! My fiance and I love having spaghetti squash with sauce and faux “meat”balls or lentils!! I usually try to eat 3 meals a day, but when I’m in a pinch, I grab a bunch of healthy snacks to bring to work and eat them at lunchtime. This year, we’re growing cantaloupe, a TON of basil (I’ll definitely be learning how to freeze it this year… whoops), tomatoes (unintentionally– there was a tomato seed in the basil seed packet! ), and a blueberry bush! My kale was completely eaten by weird caterpillar-looking things, but before that, there was a ton! Such a bummer. My favorite thing to do on the weekend is traveling to go hike someplace cool and far from where I live, since there isn’t a ton of hiking where we live now. We haven’t done that lately because we’ve been planning this darn wedding (we get married next week!!!! ), but we’re planning several weekend hiking trips for the rest of the summer and are pretty psyched! Haha, does your fiance ever cook for you or do you mainly do the delicious dishes? I used to eat spaghetti squash too and made a spaghetti squash lasagna back in the days when I was only paleo! Love spaghetti squash too 🙂 & a bunch of random snacks always helps the busy times for sure! Congrats on getting married. That is so exciting!!!! GIRL, look at those abs! I think slow progress is the best kind because it sticks! I would constantly crash diet and cut calories when I was younger and then I’d gain all that weight back. Now I make little consistent changes that add up over a period of months and it’s so much more sustainable! It’s funny because when I’m teaching during the school year, I’m 100% on a three meals a day schedule, but as soon as summer hits I’m a snacker! I try to keep all my snacks healthy and get meals in, but it definitely changes. Ben is our gardener and it’s pretty much the cutest. Over the past couple weeks he’s been planting his garden and we’re so excited for it to grow! Lots of cucumber, kale, peppers, and celery. Woo hoo! We had our first pool day of the season this weekend and it was FABULOUS! But honestly the best part of the weekend is actually slowing down and spending time together. Cheesy though it may be, we’re so thankful for those moments! Lol, they’re only there in the morning hahaha! You’re so right. Fad diets NEVER work! It’s all about little changes each day. That is amazing. Is there anything Ben doesn’t do??? Is there a reason why you are waiting until 10 am to have breakfast? I know you are an early riser (so am I, gotta be at the office for 8) and I’d be starving waiting until 10am to eat my first meal! I usually drink a full glass of water when I first wake up but I still need something around 8. I definitely try and eat three meals a day but I snack too. Breakfast around 8, yogurt/snack around 10, lunch at noon, snack around 2/3pm and then dinner at 6ish. I have two tomato plants on my porch. Love fresh tomatoes this time of year. Favorite thing to do on the weekends? Sleep in a little (til 7, ha) and then catch up on stuff around the house. Having a clean house makes me happy to come home to at night. I agree. A happy house is a clean house! Hey, have you read the book “Be Well” by Kelly Leveque? She’s a celeb nutritionist and writes a lot about how important it is to time your meals so your body has enough time to properly digest everything. 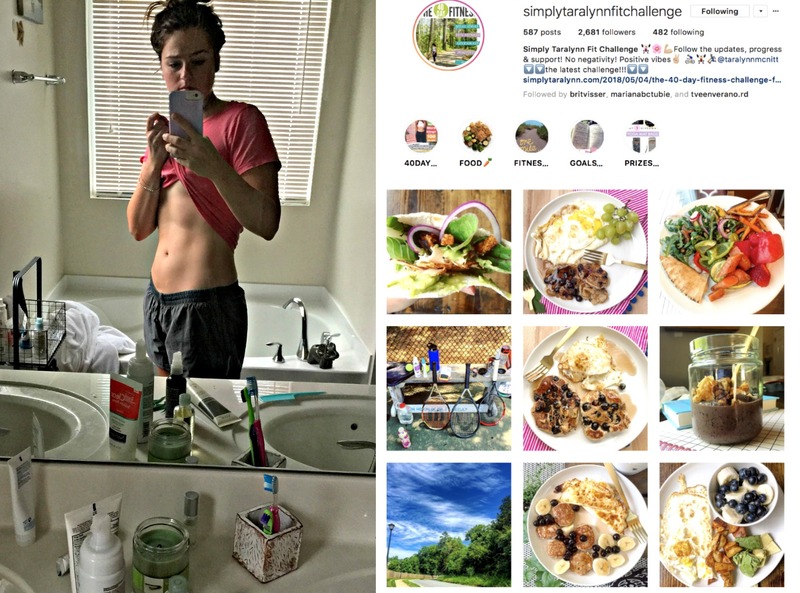 The six small meals thing is actually kind of unhelpful for a lot of people’s metabolisms….What you’re doing now sounds a lot like her guidelines. Anyways, you should totally check out her book, it made me rethink a lot about how I eat, especially my sugar intake! I haven’t, but the reason I’m setting the times is to allow digestion! I read all about it and it seems to really be helping me right now! I’m feeling less hungry all time, no more sugar cravings, more energetic, and I actually crave water. I’ll check her book out, but that’s definitely a reason behind timing the meals! Thanks for reading. Tennis and the pool is the best way to spend a Saturday! Oh no 🙁 Hopefully you have some good produce available for you though! 😉 Like the Okra you love! Cant wait for the rest of your blogs this week! I normally have 3 meals a day, with a small snack in between breakfast and lunch and then in between lunch and dinner. I find that I have to have a snack in between lunch and dinner or I’m so hungry by the time I get dinner cooked that I end up overeating or reaching for snacks after dinner. Due to my work schedule, I end up eating lunch at noon and then dinner isn’t done until about 6. I haven’t grown any produce this year, I don’t have anywhere to grow it being in an apartment, so I just hit up the farmers market or my parents house for some fresh stuff haha. My favorite thing to do on the weekend is sleep in a little bit. It is so refreshing to wake up naturally instead of waking up to an alarm. I’m still an early bird on the weekends but it still feels nice to get up around 7 or 8 vs 5 or 6. It’s always interesting to hear about people’s eating schedules! Love how we are all different. It’s always great to support the local farmers at the market! I’m excited to make a trip there tomorrow.